A few months ago, Innore was given the Product of the Year Award. Solar balcony railings helped them to first place. Winning the competition is a testament to the growing popularity of smart solutions, as the voting was open for everyone. Innore is one of our longest-serving clients. Having helped them to manufacture a bulk of their parts, we decided to contact them to further enquire about their business. Their representative talked to us about available product lines, ongoing developments and future aspirations. What can we find from your product list? Innore’s product selection includes balcony and stair railings, glass canopies, partition walls, spiral stairs, etc. This year we are launching our solar balcony railings product line. 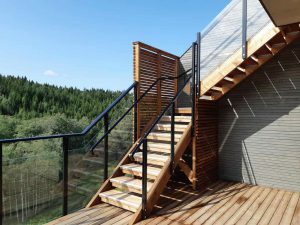 How did you end up with solar balcony railings? The idea stems from the fact that apartment buildings have a lot of balcony railings. All this unused area could be targeted for more efficient use through the implementation of solar panels. 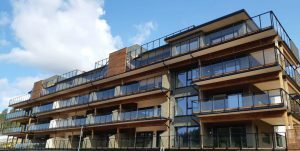 South-facing balconies can produce electricity. Doing that, we can reduce utility costs, raise energy efficiency and the building’s energy class. Also, it helps to spread eco-friendly and sustainable design. 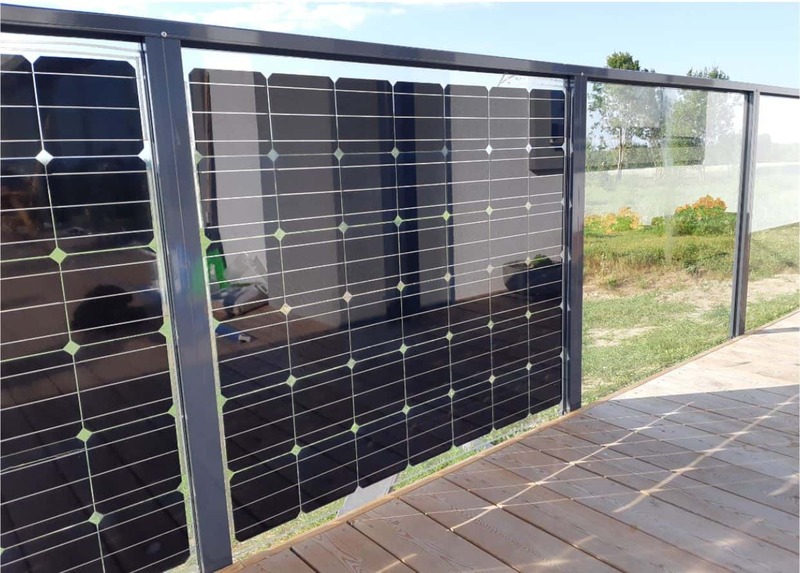 What is its advantage compared to other solar panel solutions? Solar panels are also used on rooftops and building facades. These solutions are not competing. Rather, they could complement each other. You can use solar panel railings alongside the aforementioned solutions for further efficiency. Each product has its perks and downsides. Choosing the right fit depends on the project. Railings make up a very small percentage of a project’s overall costs – about 1…2%. As there is a need for balcony railings anyway, adding solar panels doesn’t affect the total price of a construction project that much. Modern apartment buildings often come with rooftop terraces. Therefore, there is not much room for solar panels on the roof. Balcony railings have a 90° angle. Thus, their efficiency is about 25% lower compared to the ideal conditions. Still, a big advantage is that snow does not accumulate on the glass, nor does it stain that easily due to its angle. There’s a lot of sunshine in March but the Sun is low (at least in Nordic countries). This can have quite a significant effect on electricity production. Balcony railings with solar panels make the most of these conditions. What is the payback period of such a solution? This varies between projects. The cost of solar panels and other related appliances have recently decreased because of growing production volumes. The continuation of this trend will further diminish the payback period. Today, that period is realistically around 10 years. The lifespan of a solar panel railing is ca 25 years. This means that replacing regular railings with solar panel ones is actually an investment. How far have you come with R&D? At the moment we are in the development phase. We have carried out a pilot project and are working on new projects that implement this design. It also helps to improve our product. We want to finish the development by the end of this year. By that time, we will have added new projects into our scope. Mainly Nordic countries – Norway, Sweden, Finland and Estonia. As a young and developing enterprise, we want to fully establish ourselves in those markets first and move onwards from there. Do you want to focus more on smart solutions in the future? Product development is always in the works for us. The main emphasis is still on providing fully functioning and reliable solutions. There is no point in developing just for the sake of it. 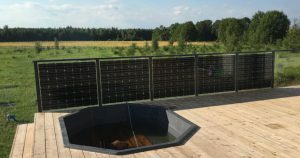 Solar panel railings are still such a new thing that people don’t know to look for it yet. It is rather a nice surprise when they find out about it. Thus, we have to concentrate on raising awareness at this point. In long term, we are definitely looking to add something of this nature to our available products. Renewable energy is gaining popularity and we are sure we can add some more compatible solutions in our field. Why do you use Fractory? Fractory helps us to serve our clients faster and in a more professional manner. There are many laser cutting service providers on the market. What differentiates Fractory, is the quickness of your online laser cutting service. The biggest advantage is the speed of quoting – it only takes seconds. Also, we never have to wait in line to get served. This is an important factor. The whole process is dynamic and effective. In business terms, every saved minute is worth its weight in gold. With Fractory, we have minimised the need for email exchange. It is mostly for exchanging ideas with you sales engineers about how to effectively manufacture something. I feel we both have gained a lot of insights through that. Why prefer it to looking for manufacturers directly? For us, Fractory is a manufacturer who represents many different ones simultaneously. Our expectations for quality and lead times are always the same, irrespective to the company. Fractory does the necessary quality checks for us and takes full responsibility for their partners. All that makes communicating with them a lot easier than talking straight to all those different manufacturers. This way we omit waiting for various offers, while still getting an offer from many options. Also, we don’t have to deal with transportation any more, as Fractory takes care of this as well. If you want to access quick manufacturing possibilities, just sign up and get a quote in less than a minute!